In addition to ministry in Kenya, Grace and Faith Family Ministries is taking the message of the Gospel of Jesus Christ to other nations in Africa. Below are monthly updates of what we are doing in East Africa (specifically Kenya) and other nations of Africa. You will find also pictures and slideshows of meetings in Uganda, Burundi and Zimbabwe. Through these times of ministry, the message of the Gospel is going forth, empowering leaders to share the unconditional love of God with people in their country. Rev. 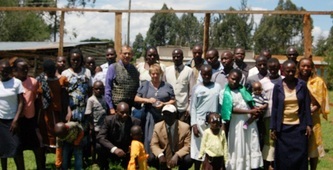 Bob and Gail Buse led a team from the USA to Kenya earlier this month. The team consisted of twelve members; eight Registered Nurses and four non- medical people. We have detailed and referenced the Medical side of the mission in our clinic news - but wanted to share with you some ministry that happened while they were here. We were so blessed the first Sunday of their visit to split into four groups to minister in four different rural churches. Each area where the teams ministered received the Word with openness, and with joy! Many people were prayed for, some where healed of diseases, and some received the Holy Spirit. God was manifesting His love and mercy through these meetings. During the following week, our non-medical team members prayed for patients who were treated at the clinic. At first, we asked the team to pray for patients while they were waiting to be seen. But, we found it more effective to pray after they had been seen, and a diagnosis had been made. 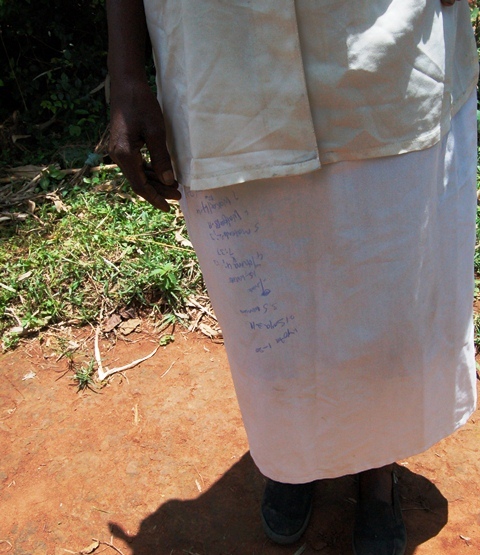 People really enjoyed being prayed for by our team members at the end of their medical visit! Two afternoons, we send teams out into our community with a small bag of rice and a about 1/2 litre of oil. The team would go into a home area, share the Love of Jesus, pray with the family for any needs, and then present the rice and oil. Each team came back rejoicing in the goodness of God! And then there were the kids! The team loved playing football with our neighborhood kids...and shared with them the Love of Jesus. The gave the boys their own football as well. At the mobile clinic, the team also took time to play with the kids and give a football. And, they spent one afternoon just loving on and playing with children in a Children's Home nearby. 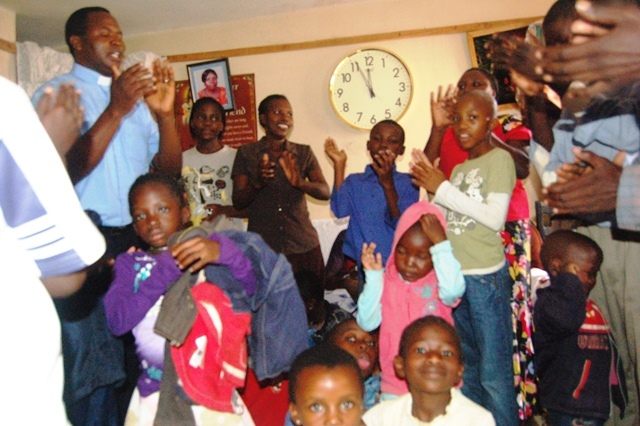 They were a huge blessing to the children - and the children really blessed the team! Thank you for praying with us as we continue to share the UNCONDITIONAL LOVE OF GOD in Ematsayi, Western Kenya, and East Africa! Together, we really DO make the difference! A GREAT OPPORTUNITY FOR YOU TO JOIN US! We are excited that Doulos Global Ministries is sponsoring a trip to Kenya to work with us at Ematsayi B.A.L.L. Mission Health Centre! The dates are January 3-January 15, 2019. Please click below for more information!!! We WELCOME you to Kenya!!! One of the mandates of the Spirit Donna and I have received is to be a catalyst for the mantle to be passed from our generation to young leaders. Unfortunately, most ministries are not willing to release their hold on the leadership roles in their ministry. This year, we agreed to hold a couple of Young Leader Summits, and begin focusing on training and mentoring young leaders to take the reigns. Our first Young Leaders Summit was really such a great success! We had a great show of young leaders for both Friday and Saturday, and enjoyed spending time with them! Bishop Javan Ommani and I shared the time, each having something to share with these young people about leadership and taking the reigns. Another part of this generational transition is to speak into the lives of those of us who are older. So many times, we feel threatened by young leaders coming in. One comment I recently heard was, "With what you are doing, you are pushing us out, there is no place for us in ministry here any longer." That could not be further from the truth - but if we are not careful to also teach our generation that stepping aside does not mean stepping down - that it's not about retirement, but re-assignment - there will be hard feelings, and cause division. For that reason, we are also trying to help "my generation" see how important it is to be active in the ministry! Thank you for praying for us - and standing with us. Our next Young Leaders Summit will be in March - and I would like to be able to take these young people to a separate place for one night. We figure the cost of this would be around $500.00, including lodging, meeting rooms, and full board meals. God never gives us a vision we can complete alone - but together we really DO make the difference! We continue to share the unconditional love of God to the people of East Africa. One of the things we have realized over the past few years is the importance of mission. Every vision must have a mission. It is important to stay within the boundaries of that mission. Our mission is to bring God's unconditional love to East Africa, sharing the good news of the Gospel of Jesus Christ and His finished work! In light of this mission, we focus mainly on two areas - Bible School Training, and medical outreaches. However, we do often find ourselves out ministering to the local churches in our area, and around Kenya. This last term, we ministered in Narok, Kakamega, and many villages in Western Kenya. We are so excited to share to good news with all who will listen! While in the United States, we continue to share this Gospel of Truth, and share about what God is doing in Africa. This year, our itinerary in the United States has really filled in. I am including confirmed meetings here, and if you are in the area, you are welcome to come and join us. We would love to see you! July 2, 2016 – OPEN – Staying in NE Iowa, so if you are close by and are interested in having us, please contact us! July 10, 2016 – OPEN – Staying in NE Iowa, so if you are close by and are interested in having us, please contact us! As you can see, we have two dates open in July - if you are in the Iowa, Missouri, Nebraska, South Dakota, Minnesota, Wisconsin, or Illinois area, and would like to invite us to come, please contact my by email! If you would like us to come and share with a small group, Bible Study, or other event during the week, also please email me! We look forward to seeing you! Together we really DO make the difference! As we gear up to return to Kenya in February this year, we are planning our activities outside of the Bible School and Clinic. This year, we have two major areas of Kenya we need to visit. First, upon our arrival in Kenya, we plan to visit the Masaai Mara to hold a graduation for Reaching All Nations Bible School there. We will also be sharing in a few Masaai churches while in the area. Later in the year- perhaps in the early fall of 2015 – we plan to visit Marsabit, Kenya, where our African daughter and her family live. We are wanting to explore the possibility of starting a Bible School in the Marsabit area in 2016. Traveling to Marsabit is quite the challenge – to drive will take three full days; and to fly is to hope to find room on a Missionary Aviation flight that only goes once or twice a week. Pray for us that both timing and provision will be revealed so we can plan for this trip. Over the past six months, Donna and I have been doing a lot of study in the area of Leadership. 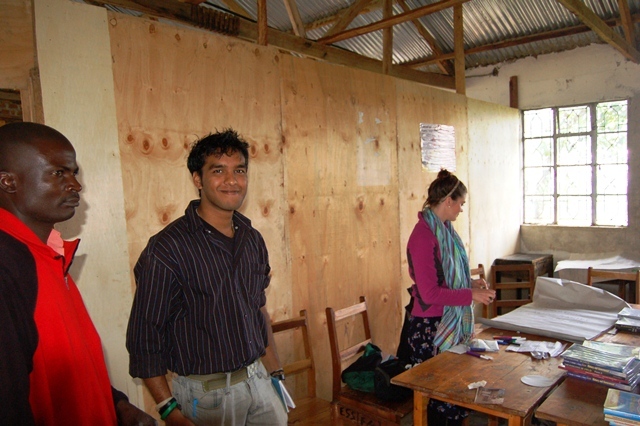 One of our goals is to sponsor three or four leadership workshops in Western Kenya and Nairobi this year. Leadership is key to church and ministry growth – but we are learning that leadership models that are geared toward church growth often use people instead of building people. We are trusting God for the open doors to train leaders to build people in their areas. By building people, we will advance the Kingdom of God! In addition to these ministry opportunities in Kenya, we are also scheduling ministry in the United States. We return to the US mid-May and plan to be in the Midwest the month of June. If you would like us to come and share about our ministry in East Africa, please contact us. We will be traveling in the states of Iowa, Illinois, Minnesota, Wisconsin, Missouri, Oklahoma, New Mexico and Arizona. We are willing to come and share with small coffee groups in your home, in your church, or civic organization. Thank you for your continued prayers on our behalf. Together we really DO make the difference! 2014 found Donna and I traveling a lot in the United States. (The picture to the left is our celebration of 40 years of marraige at a favorite restaurant in Cedar Falls, IA) We drove over 40,000 miles this year in the US alone. We have shared the vision God has given us in eleven states! The success of any missionary endeavor is through relationship – and relationship takes time. But it is time well worth spent! We want to give our thanks to all those who hosted us in 2014, and allowed us to share the vision God has given. In January, we have an assignment from the Lord to pack up our house in San Diego. We have a renter for our home in San Diego that we trust will take possession in August of 2015. However, we will be out of the country most of the first part of the year, so need to be ready to vacate when we return from Kenya. For that reason, we are trusting God for places to share our vision here on the West Coast of the United States. If you live in the States of California, Arizona, Utah, Nevada, Oregon or Washington and would like to invite us to come and share with your church, a small group, or just on a personal level, please contact us! We are also beginning to make arrangements for next summer. We will be in Oklahoma, Missouri, Iowa and Minnesota in the month of June. If you would like to schedule us to share with your group, please contact us! We would love to come for a visit! We are looking forward to returning to Kenya the end of February to continue sharing the Gospel of Jesus Christ, and training leaders for service in the church! Thank you for standing with us as we continue to walk in the call of God! God never calls us to do something we can accomplish alone. But together, we really DO make the difference! Our ministry for the past few months have been in the United States. One of the most exciting things we learned this summer was Jesus is Lord of the Harvest - we are His laborers! We go where He sends us! So we have been throughout the midwest and western states sharing off an on about the unconditional love of God! Please pray with us for opened doors in December, January and early February! If you want us to come and share about the ministry of Jesus Christ in your area, please contact us! God never calls us to do something we can accomplish alone, but Together, we really DO make the difference! WATER UPDATE: We wanted to give an update on the water project to the Ematsayi Mission and community. If you have been following the water project, you know that some friends of Ematsayi Mission in Texas had a heart to help bring water from the well to the mission, to assist in bringing clean water to the Ematsayi community. The initial project brought water from the well to tanks at the mission and at the well – but we were not able to fully hook up clean water to the Medical Clinic, nor provide a kiosk for the community. In November, a friend of our ministry came for a visit and got a heart to raise funds to complete the project. Finances were raised to make some major corrections to the first phase, which would enable us to have a water kiosk at the road in the near future, as well as provide enough water for toilets, showers, and sinks at the clinic. Enough money was raised to begin the second phase of the project – which purchased a new tank at the mission (increasing capacity from 2,500 liters to 8,000 liters), and laid a water line to the clinic. We now have successfully hooked up the sinks and toilets in the clinic, and have clean running water for our medical staff! Our next phase is to complete the toilets, showers, and install additional sinks in the clinic – and provide a Water Kiosk at the road for the community to get fresh water. The cost for this phase will be around $5,000.00. Thank you for standing with us to see clean water easily available to the people of the Ematsayi community! Below are pictures of the process of getting this project to where we are. In the clinic section of this newsletter, we have excerpts from our medical staff regarding the benefits of clean water in the clinic! Be sure to check them out! THANK YOU FOR ALL YOU ARE DOING TO HELP US IMPROVE LIVES IN WESTERN KENYA! Together, we really DO make the difference! We have visited a couple of great churches since arriving in Kenya. The first Sunday, we attended a service in Nairobi, the second Sunday we were at our home Mission Bible and Literacy League of Kenya (BALL) church here at Ematsayi. 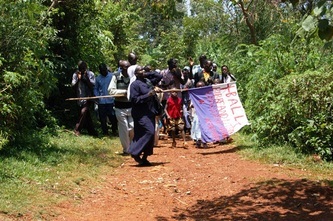 The following week, we ministered in another BALL church close to us here in in Western Kenya. Last weekend, we drove a distance to a place called Taangaroni, and preached in a Kenya Assemblies of God church. What a blessing it has been! Below, you will see pictures of these services. In addition to ministry on Sunday mornings, we are busy working with a community Water committee in getting the second phase of the clean water project finished to the clinic and community here at Ematsayi. We are so pleased that this phase includes a new 8,000 liter tank that will provide clean water to the clinic and community, as well as hooking up the pump at the well to the solar panels so there will be no charge for water to be pumped from the well to the mission. Additionally, pipes will be laid from the new tank to the clinic, and all basins, sinks and toilets inside the clinic will be connected to the clean water. This will make a huge impact on the ability of providing sanitary treatment to people of our area! Our next phase for the water project will be the building of additional toilets, as well as showers for the clinic, and a water kiosk for the community, with easy access from the road. We appreciate so much the help of our partners, friends and family in standing in faith with us for this huge project to be completed! Together, we really DO make the difference! While this section is called Ministry in Africa, the ministry we have been doing this month has been in the United States – so we are sharing our adventures here! We arrived safely in the US in December – and spent a week in our San Diego home before hitting the road. It was good to be with our daughter, Kierstien, for Christmas, and be in our home church for a couple of Sunday services. On December 30, we began our journey to the Midwest. It was a trip full of surprises and joy! Participating at the New Year’s Eve service at Faith Community Church East; sharing with a School of Ministry near Farmington, NM; a potluck and sharing at FCF Gallup, NM; dinner with partners in Elk City; OK; a “Coffee” in Tulsa; sharing in Des Moines; ministry at FCF Ottumwa, aka Jubilee Bible Church; a Coffee in Kansas City, MO; sharing with a small group at Asbury United Methodist Church in Tulsa; catching up with prayer partners in Tulsa; reunion with college friends in Albuquerque; sharing with a minister’s luncheon in West Covina, CA; and ministry at Lost & Found Ministries in Rialto, CA. After 28 days on the road, we finally got home late Sunday afternoon, January 26th. In all, we travelled 5,951 miles in January, and thank God for the great connections we made! Below are a few pictures of our ministry adventures across the US – we are so happy to have seen so many of our partners and friends! We are currently planning a new trip to Arizona, Texas and Oklahoma and back – we will have a coffee in Tucson for those interested in hearing our story and having some fellowship. This will be on Tuesday evening, February 11, 2014. For the location, please send us a message, and we will send you the address. We will also have a coffee near Dallas, TX on Thursday evening, February 13, 2014. If you are in the Dallas area, send us a message and we will get you the location! We are attending the Rhema Alumni 30th Reunion Luncheon on the 19th of February in Tulsa, OK – we are around the Tulsa area from the 15th to the 19th…if you would like to host a coffee one night during this time, let us know! We will have two events in San Diego upon our return – both which we hope to share with you in our next communication! When we are in the United States, we love to share! If you or your church would like to host us while we are in the United States, please contact us! We are in the United States until the first of March – then we will be back in the United States from end of May through July. In June we will be in the Midwest, and are looking for places to share! Please contact us for more information! Thank you for standing with Grace & Faith Family Ministries, International! Together we really DO make the difference! The end of November, we hosted our annual Bible and Literacy League of Kenya General Convention at Ematsayi Mission in Kakamega. We had over 300 in attendance this year. Pastors, leaders and church members came from as far away as Nairobi and West Pokot to join us at our convention. We were especially honored to have Rev. Grace Swett, a Kenya born citizen of the United States, as our guest speaker in the evenings. Such powerful messages were delivered by the anointing of the Holy Spirit. People were saved, filled with the Spirit, healed and set free through the ministry of the Spirit! 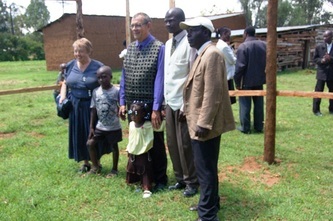 In addition to the convention, Donna and I minister every Sunday in a different rural church here in Western Kenya. 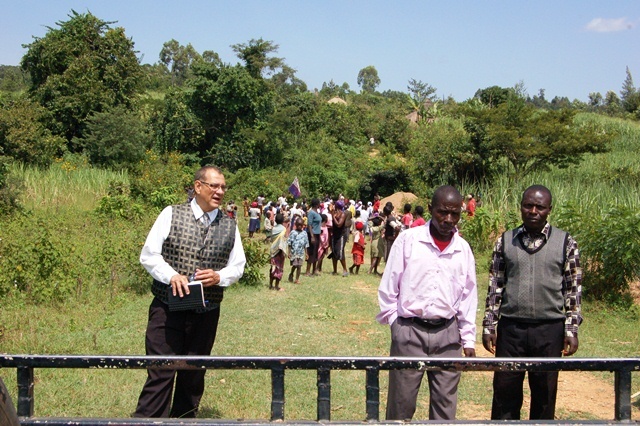 Two weeks ago, we were in Nambale, Kenya – almost to the Ugandan border, with Pastor Miriam Matunda. Pastor Miriam will be entering her fourth year at our Bible School in April. 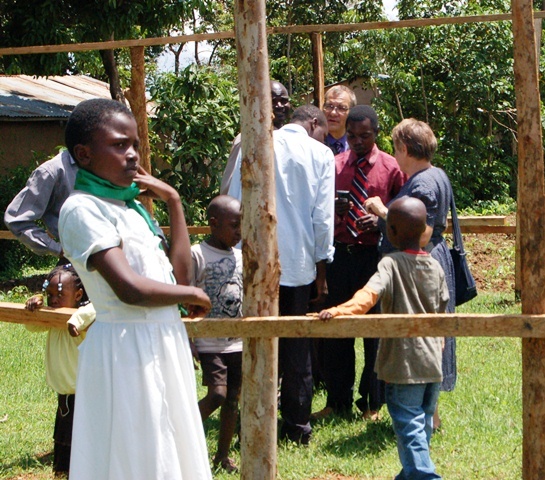 She and her husband lead the church in Nambale, and Pastor Miriam oversees a few churches in the Busia district. The church was such a blessing to be a part of – we are standing in faith with the church as they begin a building program! They have a plot on which to build, now they are waiting for funds so they can make bricks and begin construction. For most American Pastor’s, building a church in Kenya would be a breeze! No permits, no “building codes” or ADA guidelines! When you find where you want to build, you purchase the land, and begin! Last week, we visited a Bible and Literacy League church in Embale – not far from the mission compound. This church had been in existence for some time, but due to a split in the church, the actual building was lost about a year ago. After a short time, it was decided to find a plot to build a new facility for this community. One of our pastor’s, Aggrey, donated some land for this purpose. As for now, the church is meeting under a tree, or in a home every week. However, the plot has been designated, and the church planning committee has designed the plans for the initial stages. The pastor of this church is a very young man with no training – he has expressed interest in coming to the Bible School in April, and we trust God for provision to make this happen! Now that we are in our final few days at Ematsayi, we are busy closing things down. We will have final meetings with each of our committees, and final meals with our staff and friends! On Thursday we head to Nairobi, and Sunday will have our final service of the year at the Bible and Literacy League of Kenya church in Dandora phase 4. Thank you for your partnership with us in Kenya! Together we really DO make the difference! There is great excitement in the Ematsayi area! A new pump has been installed at the community well, and a spigot for easy use has been installed. 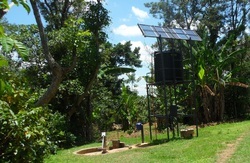 In addition, a pipe is now bringing water from the well to the mission! This is the first time the mission has had clean water! We are so grateful to God for this provision! It is the bulk of what needed to happen so we can have running water in the clinic. Now, we need to run a pipe from the tap at the clinic to the tank above the clinic, and then plumb lines to each of the rooms where sinks will be placed, and toilets will be used. We have been working with the Ministry of Health to bring our clinic from a dispensary to a full-fledged clinic, and eventually to a mission hospital. In addition to the water coming to the mission, we have been busy preparing for our annual General Conference which will be held next week. We have a guest from the US, Apostle Grace Swett, coming from Des Moines, IA to minister in the evenings to our conference. During the day, various ministers from Kenya, along with Dr. Ver, Donna and I will speak on various subjects. Typically we have between 300 and 400 church leaders and pastor attend our annual convention! It is a highlight of the ministry! A major highlight for us in late October and in November was we were asked to officiate at two weddings! James and Lilian were married in Kakamega on October 26th, and Andrew and Selestine were wed at Ematsayi Mission Church on November 23rd. It was so exciting to officiate at these ceremonies – and we had so much fun!! Lastly, Donna and I wish to thank Rev. 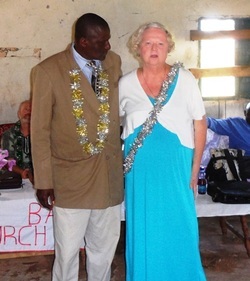 Gail Buse, the International Ambassador for Faith Christian Fellowship, International, and Rev. Debbie Brubaker, the Media Director for FCF, for visiting us this past week. We had a great time of connecting, and casting vision! THANK YOU FOR ALL YOU DO TO HELP US STAY ON THE MISSION FIELD! Together we really DO make the difference! This past month we have been busy with leadership training. The Lord dealt with us in July that we needed to break into smaller groups of 10 to 12 to train our leadership, rather than 30 or 40 people at a time. Just as Jesus had three major circles (his three closest disciples, the twelve, and the seventy), so we must break it down to effectively train those who are to carry the vision. So this last week we invited 12 members of our organization to come and be a part of our leadership development. We had such a great response! Pastors Dan and Mary Wilson from Bandon, Oregon shared with our group in the evenings, and we did training during the day. From this meeting, we are now able to begin developing leadership for this group that will cause it to stand in every situation! In addition to training leadership, we visit local churches to encourage and pray for them, their pastor, and their vision. It is an encouragement to the people who live so far interior to see someone who cares enough to come and visit! And, it is our joy to minister to each of them! This past week we were in a church close to home – and for lunch, as usual, we had Chicken – the piece of chicken on the top of the pile was the full head and beak of the chicken! But we had a great time, and prayed for many who were sick and many who had needs! 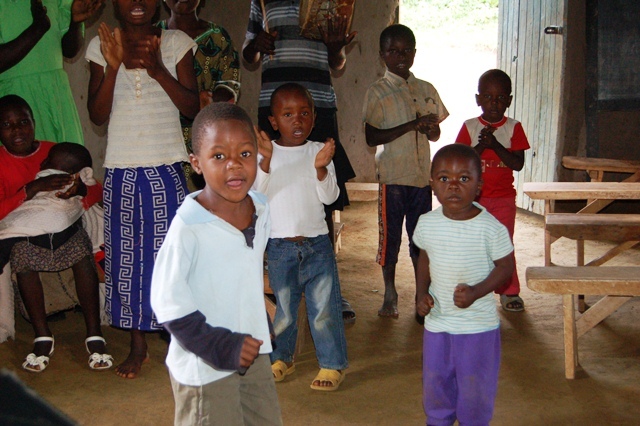 Pray for us as we continue to move forward with BALL (Bible and Literacy League of Kenya). Our Bishop has recently had some challenges with his health, and was contemplating his future. For now, he has requested to take a Medical Leave of absence for two months to allow his body to fully recover. During that time, I will be working with both the Assistant Bishop and the General Secretary in leading BALL. This puts more demand on my time and resources – but we feel it is necessary to allow the Bishop to fully recover. Please pray for me! I am praying as Solomon prayed that I would have wisdom and understanding in governing these people! Lastly, we began talks today with a missionary couple who are interested in starting a school of agriculture here at Ematsayi. We would train students to raise milking cows, livestock, raise chickens, etc. Please pray that we all have the wisdom of God in getting this off the ground – we need to build a barn for our zero-grazing cows, we need to prepare the land for raising of crops, and we need favor in the area to get the school recognized. This is a great opportunity, and we are trusting God! Thank you for your partnership with Grace & Faith Family Ministries, International. Together, we really DO make the difference! I haven’t posted much in this section for the past few months. When we were in the United States, we kept busy with conference schedules, but did not have much “ministry” as such going on. Now that we are back in Africa, that has changed! Our first Sunday in Kenya, we ministered in a Masai village outside of Narok, Kenya. It was a powerful day with a great manifestation of the Love of God! 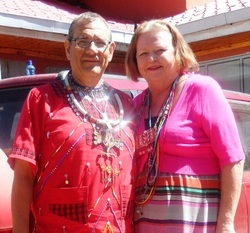 Donna and I love the Masai area – and the people are such great people! For the next six weeks, we will minister in local churches around Kakamega, and hold three major leadership meetings. Two of these will be outside of Western Kenya – and we need your support to accomplish these meetings. We will travel to Kitale right after our school session, and spend three days in the West Pokot area. For safety sake, we will stay in Kitale, and drive an hour or so from there to where our meetings will be held. The cost of these meetings will be $200.00 per meeting – if you would like to help us defray these expenses, please click here. This last Sunday, we laid a cornerstone for the building of a new permanent church for one of our local churches in the area! We are always excited to see new permanent structures built for the Kingdom! These churches are making a huge difference in our communities. For each Bible and Literacy League Church we help build and plant, we also start a day-school for children in the area. As the school develops, the government often comes and offers to also support the school, making it a community primary school for the area. In addition, we are working on plans to expand our outreaches into areas where the gospel is not readily heard. Please continue to stand in faith with us as we train leaders in East Africa! We are so looking forward to getting back to Kenya and working with the people of East Africa! Life is always full of change - and certainly our lives are changing every day. As we head to Kenya, we have three areas of ministry (outside of the Bible School and Clinic) which we hope to accomplish this year. As we have mentioned before, our first order of business will be to have a leadership conference at Ematsayi with the upper leadership of Bible and Literacy League (BALL). This will be a small gathering of about 20 leaders where we will be discussing leadership principles that will help us grow in our next stage of development. Pray for the success of this conference. The second area of ministry is to continue visiting BALL churches in Western Kenya - sharing the good news of Jesus Christ as we see the work of ministry in each area. In September, we plan to visit churches in the Pokot region, and see the work that our pastors are doing in that area. This will entail a bit of travel for us - and we will need to replace the tires on our vehicle to be successful in our journey. 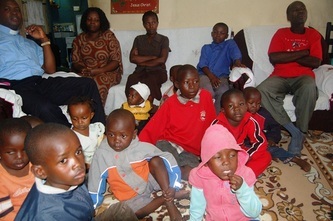 Pray for provision for us as we move forward in expanding the ministry in Kenya. Our third area is to visit a new region of Kenya - Marsabit. Marsabit is a county in the Eastern Province of Kenya. It's population is around 300,000 inhabitants. It is in northern Kenya, and borders Etheopia to the north and Lake Turkana to the west. One of our Bible School instructors will be moving to Marsabit in August, and we hope to travel in October so visit them, and see how we as a ministry can make a difference in this area. We will also visit a contact in the Samburu area, which is on the way from Nairobi to Marsabit. Over the next year, we will be going through a lot of transitions and changes. Please keep us in your prayers - and we will continue to keep you updated on our progress! Thank you for all you do! Together we really DO make the difference. As we prepare to return to Kenya, our schedule is beginning to come together. One of the major outreaches we are doing this year is ministry to leadership in Western Kenya. We have two leadership conferences in Kakamega scheduled before the end of December. Leaders come to our mission for training, but we have agreed to feed these leaders while they are with us for the two day seminar. The budget for each of these conferences is $250.00 per conference. I need sponsors to help us with these conferences this year. If you or your church would like to sponsor these events, please contact us. In addition to the conferences at the mission, we will also be holding local church and regional growth seminars. During these events, we work with local leaders in developing vision for the local church. These require that Donna and I travel to the area, stay for three days, and then return to our home. Each of these seminars require $200.00 per seminar to complete. We try to do one of these seminars at least once a month while we are in Kenya – and when finances allow, we do two a month. At this point, we feel that we would like to hold four of these events before the end of the year. In addition to these ministry events, we have been given an opportunity to explore future ministry in the county of Marsabit, in north-eastern Kenya. Of course, the major cost involved in this exploration is transportation. Pray with us that doors will open for us in this area – we are looking at November as the month may take this trip, and will keep you updated. Thank you for your partnership with us in ministry! Together, we really DO make the difference! Probably the most exciting news this month is our announcement that Donna will be joining me full time on the field effective the first of June! I am so excited that we will at long last be working side by side in ministry. Joyce Meyers wrote a book a few years ago, “Do it Afraid.” While this next step brings some uncertainty, we know we must move out and “do it”! Thank you for your prayers and for your support. The next two months will be very busy for us – but we are still looking for opportunities to share about what God is doing in East Africa. From the end of May to the end of June, we will be in the Midwest – in the states of Iowa, Minnesota, Missouri, Oklahoma, and Illinois – we have only one of four Sundays booked just now – and are definitely looking to share with congregations and small groups. If you know of any opportunities, please drop us a line. From the first of July we will be back on the West Coast – and will be available to California, Nevada, Oregon, and Arizona. Let us know if you want us to come! 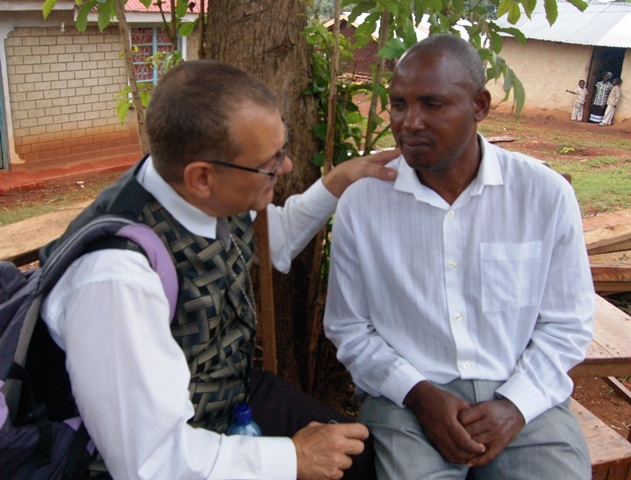 Ministry in East Africa continues to expand. In April, we sponsored a leadership event in Kakamega. It was so successful. 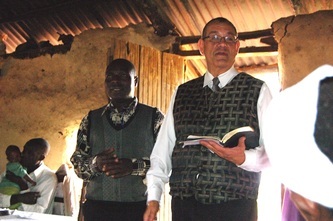 Last week, I ministered to leadership in a church in Shibuli, Kenya. It was so rich to share to these people who have a heart to lead! In August, we plan to sponsor another leadership event at Ematsayi. This will be the second of three of these events we sponsor for the Bible and Literacy League of Kenya this year. If effective change is to come to these people, it must start with the leadership. We have also scheduled two additional leadership meetings with local churches in the West Pokot areas. We will also be ministering in a number of churches in Western that are affiliated with Bible and Literacy League, and churches where we have student represented. Additionally, we have been invited to Marsabit to explore areas of growth and expansion into that area of Northern Kenya. This is an area that borders the country of Ethiopia, and has not been overly evangelized. I have met a young man who is from this area, who has a heart to train young men and women for ministry, and birth vision in these men and women for service in the poorest areas of Kenya. As we continue to take each step by faith, God continues to open doors to areas we have been praying over. Finally, a wonderful opportunity has presented itself to us - for the past few years, we have been speaking to a man who worked at a local supermarket in Kakamega. He seemed to take a liking to me, and I have always made sure to greet him and ask him how things are. Turns out, he OWNS the supermarket in Kakamega, and one in Bungoma and one in Busia. He is from India - and a devout Hindu...in fact he told me that his family is the equivalent of a priest in their temple. Anyway, this trip he invited me for tea, and showed me his entire operation in Kakamega. He then invited me into his home and we had lunch together. It was a great time! I believe God has opened a door for us to share the love of Jesus with this man and his family! I gave him a book, written by a good friend of mine, about 101 things everyone needs to know about God - and he was so excited to receive it! I am believing that God will open the doors for us to share to gospel with Hindu people in Kenya! Grace & Faith Family Ministries International cannot accomplish everything God has called us to do without your support! Thank you for joining us in prayer – and thank you for your financial partnership with us as we continue to make a difference in the lives of these people! Together we really DO make the difference! Originally, the plan was for me to be in East Africa from the end of February. However, after much prayer, we felt it best to wait until after the elections in March to travel. So, I am now looking for the right dates to travel. I will be leaving for Kenya March 27th. Once in Kenya, I will travel to our home in Kakamega to celebrate the resurrection of Jesus with the home mission church at Ematsayi. That following week, we will have the Executive Committee and all of the Overseers of Bible and Literacy League (BALL) gather for a two day intense Leadership Encounter. This two day event will start to lay out principles of leadership that will help BALL move toward a greater awareness of quality leadership. After this meeting, we will continue our planning for the annual Youth Convention we hold at Ematsayi. This year, we have an Evangelist, Ronnie Gonzalez, coming to speak at our Youth Convention, then will hold an evangelistic crusade in West Pokot immediately following. We are expecting a great move of the Holy Spirit! Other smaller projects will include a visit to Narok, Bungoma, and Nairobi. I will be working with the Medical Committee to prepare for continued and expanded medical services in Western Kenya. Grace and Faith Family Ministries International represents YOU in Kenya! Thank you so much for sending us! Together we really DO make the difference! We have returned from our final trip to East Africa for 2012. What a great year this has been! We have seen such change in the lives of those to whom we minister. There is an awakening to the truth of God’s Word – and people are seeing in their own lives how the Word changes their circumstances! We are rejoicing for these steps forward. This past year, we had three major conferences with the Bible and Literacy League of Kenya, and spoke at two additional conferences with other groups. We sponsored three leadership workshops, two in Nairobi and one at Ematsayi. We ministered in so many different churches – baptized eight new converts (four from Islam) and saw over 150 people filled with the Holy Spirit! Looking back, we see some great strides forward in 2012. Looking forward, we see so much yet to do. As we were praying over the 2013 year, we felt the Lord giving us a theme for the year – “Reigning in life through the abundance of Grace.” I will return to Kenya March 1 to continue the work. In 2013, we have three major leadership workshops planned for the leadership of Bible and Literacy League. One will be in March, one in August, and the final one in December of 2013. The key to lasting change in Africa is training of leaders to lead! We are excited to have Evangelist Ronnie Gonzalez join us in April for our Youth Convention and to hold a crusade in West Pokot – near Kitale, Kenya. We are so excited to have Ronnie and his team come to do a crusade in West Pokot – we have trained a few men from that area in our Bible School who are more than ready to shepherd new converts! And this is an area in Kenya that needs the gospel so much. In August we will hold our annual Women’s Convention – and then our annual General Convention will be in November. We are trusting God that a team from Destiny Church in San Diego, CA will join us in November for our General Convention. 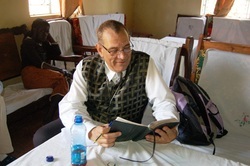 In addition to the ministry with Bible and Literacy League of Kenya, I will also teach at Reaching Nations Bible School near Narok, Kenya in March. I also trust God to make a trip to Lodwar once again to follow up on some contacts in the Turkana area, and wish to visit a new area in Samburu. If times and finance allows, I would also like to travel to Uganda to visit our churches in Eastern Uganda. The doors of ministry are open to us! Thank you so much for helping us accomplish the vision God as given us! Together we really DO make the difference. We are busy preparing for our trip to Kenya, leaving November 23rd. This trip will be full of bringing to our community the unconditional love of God. Just a week ago, our Bishop’s grandson was murdered in Nairobi. Please agree with us that we will have the right words to bring healing to the hurting people in our area. We will be ministering in Nairobi at a Bible and Literacy League of Kenya church the first Sunday we arrive. We then plan to travel to Kakamega on Monday or Tuesday of that week. Wednesday we will open our annual General Convention at Ematsayi Mission. This will be three days of teaching and ministry to the leaders of BALL, and to guests who will attend. Our focus is always leadership development for this convention, and I will be speaking on “Sowing and Reaping” this year. God has placed a message in my heart concerning the sowing of our seed to reap a bountiful harvest in light of the finished work of Christ Jesus. It should be a powerful time together. At the end of the convention, we will have our Bible School Graduation. We will then spend a couple of weeks in Western Kenya working with the Executive Committee developing our agenda for 2013, and setting our goals for the coming three years. My work permit will expire in 2013, and we expect to begin working on renewing it during this trip as well. We will then travel to Narok, Kenya to minister among the Masai. 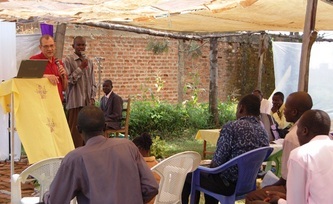 We will be speaking at a graduation ceremony there, and in a few churches in small villages. The people of this area have been so receptive of our message, and we love sharing God’s unconditional love with them! We end our trip back in Nairobi at a BALL church in Dandora. This is a new church plant in Nairobi that we helped get going, and have been so encouraged with the growth and development of the ministry there. We will board a flight to the US after that service, and get home around 6PM Christmas Eve. Thank you for your prayers for us while we travel this season. God is faithful – and we believe we will see many wonderful things! Together, we really DO make the difference. This trip to Kenya will be full of opportunity for ministry. The first two trips to Kenya are always focused on the Bible School; this last trip is when we focus on ministry in churches. We will leave for Kenya on Thanksgiving Day – and spend our first weekend in Kenya in Nairobi with the Bible and Literacy League of Kenya’s churches in Nairobi. On Monday, Donna and I will travel by bus to Kakamega where we will open our general convention on Wednesday evening. Friday, we will have a huge celebration as we graduate our first and second year students from the Bible School in 2012. The following two weeks we will be ministering in local churches in Western Kenya, and then travel to Narok to speak at the graduation of a Bible School there. While we are in Narok, we will also minister in various Masai churches, sharing the glorious good news of the Gospel of Jesus Christ. We will end our trip back in Nairobi for a few days as we work on renewing our work permits for 2013 through 2015. While we are in Kenya this trip we will also be laying out the blueprint for 2013. We plan to leave for Kenya again right after their elections in March. We will be working with BALL’s executive committee in setting a program where we will have outreaches in Turkana in the Spring, leadership training in Western Kenya, and ministry among the local rural churches. Thank you for helping us share the love of Jesus in East Africa! Together we really DO make the difference. 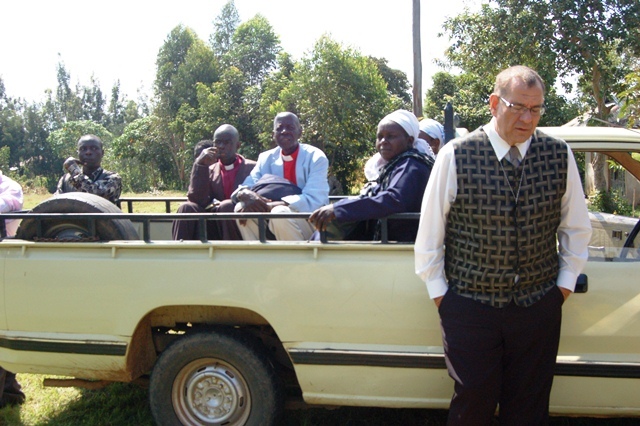 This trip, I ministered almost exclusively with Bible and Literacy League of Kenya. When I arrived in Kakamega, the Women’s Convention was already in progress. A great couple from Texas, John and Mary Catherine Lolley were the guests of Ematsayi for the Convention and did such a wonderful job! The first weekend, I ministered in Bukura at the Fire Fest Conference with Jesus Liberation Centre, Apostle Oliver Asuga. I preached two consecutive services on Saturday – and it was so powerful! Five people came forward to receive the Holy Spirit, and all spoke in tongues right away! It was so wonderful. 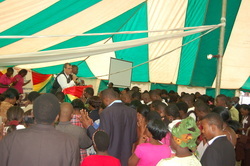 On Sunday morning, I ministered at the Ematsayi BALL church located on the mission headquarters. I then hosted a dinner for all the guests from the Us and their friends from Nairobi. It was such a great time of the Word and of fellowship! God is so good! 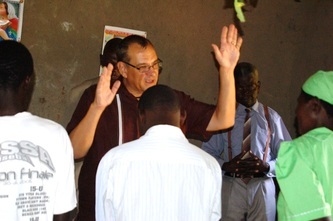 The second Sunday I was in Western Kenya, I had the privilege of officiating at the baptism of 8 new converts. One of the Baptism candidates was Rashid. Rashid’s son passed away suddenly in 2011. This young man had made a decision for Jesus Christ, even though his family was Muslim. When he died, his father decided to allow his son’s church to participate in the burial. I was the preacher for that burial service. After preaching the Word – I went to Rashid and told him that God did not kill his son – but God loved him so much and would turn this situation around for his benefit! I then told Rashid how much we loved him, and we would be praying for his family. A few months later, Rashid made a decision to make Jesus the Lord of his life! 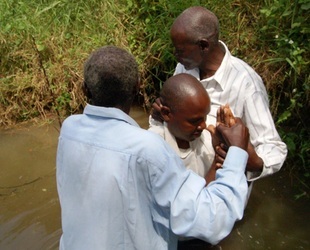 As a result of his transformation, 3 other Muslims in his community also received Jesus – so four (4) of the eight (8) baptized were former Muslims. It was a powerful service, and so many came to witness the baptisms! Afterward, I ministered on the Holy Spirit, and all eight of these people received the baptism in the Holy Spirit and all spoke in tongues! What a glorious day! The pictures below are of the Baptism day! The third Sunday, I preached near Malava, a village not far from Kakamega. 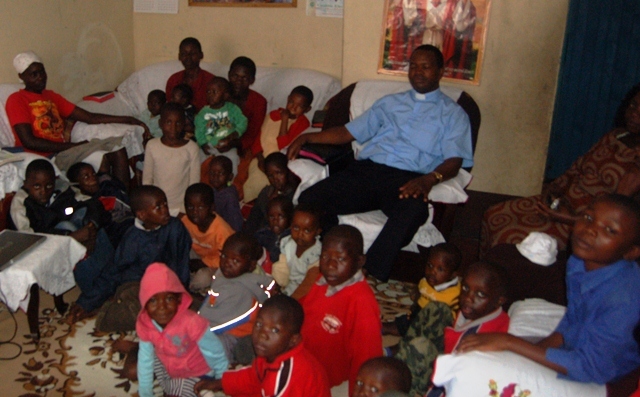 It was in a small church that my wife and I visited when we first came to Kenya in 2006. We had a great time, with a small group of people. Four came forward to receive the Holy Spirit, and all were filled! Praise God! After the service, we had lunch with some of the members of the church, and unfortunately did not finish before the rains came – and boy did they come! We had no choice but to wait until they had finished – so many were riding in the back of the pick up. Finally it was so we could travel, and we drove to Kakamega town. When we arrived, there had been a huge crusade in town, and the traffic was jammed from the entrance throughout! We finally made it to our road to Ematsayi – but the rains had made the roads very slick – and we nearly went into the ditch – I was very happy to pull into my driveway and rest! The fourth Sunday I spent in a vehicle traveling from Kitale to Lodwar – an 8 hour drive through dangerous conditions and roads. (check out my travel blog for September 9). I am now in Lodwar, where we will work with Feed the Hungry to distribute food near Lokichar tomorrow and Wednesday. We are making a difference in the lives of so many people! Thank you for your contributions that help keep us on the field! There are many doors of opportunity opening for Grace & Faith Family Ministries in East Africa. In August and September, there are opportunities for leadership training sessions in Nairobi, and Kakamega. Additionally, the Grace and Faith International Bible School will begin its second term August 20, and run through September 7. (You can read more about the Bible School under our Bible School news.) 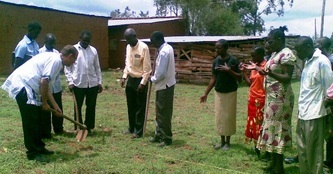 We will be working to “tend and fertilize” our Children’s Home in September (read more about our children’s home here). While I had hoped to have the time to visit two areas in Kenya and travel to Burundi on this trip, time constraints have caused me to postpone those plans. This trip, I will be concentrating on the leadership development of the leaders of the Bible and Literacy League of Kenya (BALL), and working with individual churches. I will be hosting a three day Grace and Faith Seminar in Nairobi the end of September, and have two or three leadership seminars in Western Kenya and one in Nairobi. Please pray for me as I prepare to minister to the members of BALL – this has been a difficult season for the ministry in Kenya, and we are in need of a fresh touch of the Holy Spirit! Thank you for helping us to fulfill the call in East Africa! To make an online donation, please click here. Together we really DO make the difference! May 2012: On this trip to East Africa, I was privileged to be a part of two church plantings! One in Nairobi, a BALL church that will now be located in Dandora area of Nairobi. When I was with them, they had been meeting only 8 weeks – and were meeting in a home. Now, they have a building where they are holding services. 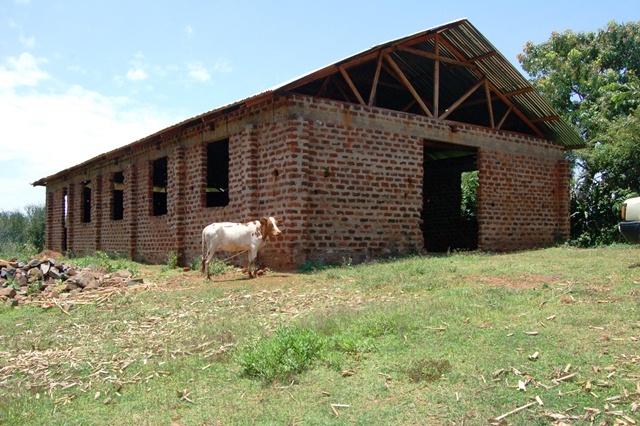 The second church is a church in Bungoma, Kenya. This church has been going for about a year, but they had a ground breaking ceremony for the building of their church while I was there! We are grateful to our partners and friends who make it possible for us to be a part of these new works in Kenya!